Snow has returned to the BWRA in it's usual blustery fashion. Extreme Southwest winds & accumulations of up to 16" of new snow will increase the avalanche activity for the next few days. Expect Storm & Wind formed slabs to be plentiful & sensitive on aspects NW-N-NE-E. Late season complacency from anyone you are riding with should be addressed in your pre-trip preparation. Snow has covered objects & streams that have been melting out recently, keep an elevated awareness & make situations known to those in your group. We have closed Sardine Meadows due to opening streams & critical habitat protection. Extreme winds from yesterday & this morning have created thick pockets of Wind slabs on leeward aspects. The swirling Southwest winds have formed tender slabs on slopes facing NW-N-NE-E. Cornices will help indicate where likely slabs exist & should be considered high consequence areas. Remember that triggering a slab remotely could propagate an avalanche far above you possibly effecting your whole riding contingent. Remote weather stations are showing 10-16" of accumulation, probably with the winds help, at a rate of 2" per hour. Heavily influenced by gale force winds, most of the storm slab potential will be located near & below treeline. The new snow will have the recent melt-freeze crust acting as a good bed surface for avalanches. Dig into & ride low consequence test slopes to gather info about your chosen riding zone. This avalanche problem will be directly related to how much the clouds lift. Today this issue will be possible & tomorrow (Tuesday) it shall quickly become very likely with the abundant sunshine. Spring was ousted last evening as winter plunged itself back into fruition. Freezing temperatures & wind driven snows have accumulated on leeward aspects NW-N-NE-E. Wind slabs could be very deep in association with the gale force winds from the Southwest. Storm slabs will be thick & avoidance will be key today as things settle. If skies clear the likelihood of Loose Wet activity will be elevated. Expect the melt-freeze surface snow to be a supportable bed surface for avalanches to slide upon. 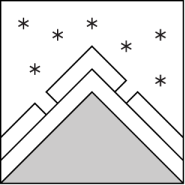 No new avalanches to report for Sunday, although if skies clear today we will see activity. Moist & unfrozen snow surfaces were mostly unsupportable. Look today for Graupel that may have fallen with last nights storm. Consider Graupel within the new snow as a contributor to increased instability. Max. temperature in the last 24 hours: 45 deg. F.
Yesterday we saw strong SW winds & 6.6C degrees (44F). No refreeze Saturday evening left moist & unsupportable snow surfaces. Sunday evening brought cold temps, snow, & of course gale force winds from the SW. Local Snotels are reporting between 10-16" of new snow at 6AM with 27F degrees (-2.8C). Temperatures: 24 to 32 deg. F. 11 to 17 deg. F. 34 to 42 deg. F.
Expected snowfall: 2 to 4 in. 2 in. 0 in. Temperatures: 16 to 23 deg. F. 6 to 11 deg. F. 28 to 33 deg. F.
Expected snowfall: 2 to 5 in. 2 in. 0 in.